Specializing in problems of the Ear, nose, sinuses and throat. An ear, nose and throat specialist (ENT) is a physician trained in the medical and surgical treatment of the ears, nose, throat, and related structures of the head and neck. They have special expertise in managing diseases of the ears, nose and nasal passage sinuses, larynx (voice box), oral cavity and upper pharynx (mouth and throat), as well as structures of the neck and face. ENT is the oldest medical specialty in the United States. Swallowing is a basic bodily function that is easy to take for granted. Because most people swallow without effort, it can be easy to forget that swallowing is a complex mechanical process that requires multiple muscles and nerves. Many people deal with problems swallowing, also known as swallowing dysfunction, as they get older, but that doesn’t make the problem any less scary. Read on to learn more about swallowing dysfunction so you and your doctor can find the right solution. Difficulty swallowing (also called dysphagia) can be caused by a variety of different issues. The first step to determining the cause of your problem is to identify which part of your body is creating your symptoms. First of all, problems related to your esophagus or digestive system such as acid reflux (GERD) can cause swallowing dysfunction. If you are experiencing stomach pain, digestive problems, or heartburn in addition to your swallowing difficulties, investigate these issues with your doctor. Nervous system conditions, such as Parkinson’s disease and Amyotrophic Lateral Sclerosis (ALS) often begin with swallowing difficulties. These problems are serious, and early detection is crucial. If you develop swallowing problems and are also experiencing numbness, pain, or lack of mobility in other parts of your body, see a doctor right away. Because swallowing dysfunction can be caused by a variety of issues, it can present with a variety of symptoms. General signs of a swallowing problem include coughing during or after eating, a wet or strained voice after eating, and having a hard time breathing after eating. People with this condition might also get food stuck in their mouth or have issues keeping food in their mouth. People who have problems swallowing may also be limiting their food intake without even realizing it. Weight loss is a common sign of a swallowing disorder, especially in the elderly. Secondary symptoms due to a lack of food intake are also common signs of a swallowing disorder, such as dehydration or nutritional deficiencies. Patients may also experience food going into the lungs or airways, which can cause lung infections or even pneumonia. Because eating is often a social activity, these problems can be embarrassing and lead to isolation. If you are caring for an elderly person who suddenly wants to eat alone, have a doctor evaluate their swallowing. If you or someone in your care is dealing with a swallowing problem, seek medical help. Before offering a treatment plan, a doctor will perform tests to determine the cause of a person’s swallowing dysfunction. These tests can include X-rays, swallowing tests, endoscopies, or CT scans. These tests can sound intimidating, but they will allow doctors to determine the exact cause of the swallowing problem. After diagnosis, your doctor will create a treatment plan to help ease your symptoms. Treatments might include medication, surgery, physical therapy, or speech therapy. If you are having problems swallowing, don’t wait to find relief. Contact Dr. Michael Burnett at 212-867-4813 to schedule an ENT appointment today. Sinus headaches are often the most painful part of a sinus infection. These headaches cause pain that radiates and is often severe enough to impact your daily life. In fact, sinus headaches are often confused with other types of headaches like migraines, making them difficult to treat. Read on to learn about sinus headaches so you can get the correct treatment for your problem. Sinus headaches are caused by inflammation or infection of the sinus cavities. Your sinuses are a connected series of cavities near your nose. These cavities are very delicate and prone to irritation and infection. During a sinus infection, a patient will experience a variety of symptoms such as nasal congestion, postnasal drip, and fever. One of the most common sinus infection symptoms is a sinus headache that is caused by this irritation. These types of headaches usually start with a painful or full feeling in your forehead or above your cheekbones. If the pain is severe, it can radiate across your entire face and head. Like other types of headaches, you may experience dizziness or sensitivity to light and sound when dealing with a severe sinus related headache. Knowing the difference between sinus headaches and other types of headaches is an important part of finding relief. Different headaches respond to different treatments, and your sinus headache will only heal if you address your sinus symptoms specifically. Headaches of the sinuses are often confused with migraines. Many sinus infection symptoms, such as nasal congestion and forehead pressure, are also migraine symptoms. Pay attention to the timing of your headaches. Sinus headaches will usually occur during a sinus infection, while migraines can occur at any time. Migraines also tend to be hereditary and are more common in women. In addition to migraines, cluster headaches and tension headaches can also be confused with sinus headaches. Take detailed notes on your symptoms and monitor the exact location of your pain. Only your doctor will be able to truly diagnose your type of headache. The good news about sinus headaches is they usually respond very well to treatment. If you are experiencing sinus headaches due to chronic sinusitis, your doctor will first determine the cause of your infections and prescribe a medication to help. Many people with frequent sinus infections do not realize they need antibiotics to treat their symptoms. Over-the-counter medication and home remedies can also be helpful, especially for patients who want to prevent more sinus issues in the future. Saline rinses and humidifiers are simple and affordable ways to keep your sinus cavities clear and comfortable. Chronic sinusitis is the most common cause of sinus headaches. However, growths such as polyps or tumors can also be to blame. Your doctor might recommend a laparoscopy or CT scan to get a better look at your sinus cavities. Suffering from sinus headaches can majorly impact your life. Don’t wait to find relief. Contact Dr. Michael Burnett at 212-867-4813 to schedule an ENT appointment today. If you deal with chronic nasal congestion, postnasal drip, or sinus infections, you are probably desperate for relief. Many different problems can cause these symptoms, but if you’ve been trying different remedies with no relief, you may be dealing with nasal polyps. Nasal polyps aren’t life-threatening, but they can cause symptoms that disrupt your life. Read on to learn more about this condition. Nasal polyps are soft growths that form in the sinuses or nasal cavities. They are not cancerous and usually not painful, though their growth can cause pain in the surrounding areas. Nasal polyps can occur at any age but are mostly found in adult patients. Small polyps usually don’t cause any symptoms, so most patients do not know they have them. However, larger polyps can cause inflammation and obstruct the nasal passages and cause a person to have a variety of nose and sinus issues. Common symptoms include a chronically runny or stuffy nose, frequent postnasal drip, headaches, sinus pressure, and chronic sinusitis. Not all cases of chronic sinusitis are caused by nasal polyps though. If you’re dealing with this issue, your doctor will be able to determine the exact cause of your sinus infections. If you have nasal polyps, there are a few different treatment options available. The first treatment offered to patients is usually medication, which will target the polyps and help to keep the nasal passages clear. If over-the-counter sinus infection or allergy medication does not relieve your symptoms, your doctor can prescribe an antibiotic or nasal steroid spray to give you relief. If your nasal polyps do not respond to the prescription medication, your doctor might also recommend surgery. Small polyps can be removed in an outpatient procedure called a polypectomy which uses a small suction device to remove the polyps. Larger polyps might require laparoscopic sinus surgery. During this procedure, your doctor will use insert a small camera into your nostril to monitor your polyps during removal. While this procedure is more involved than a polypectomy, it is still usually performed as an outpatient procedure. If you suspect you are dealing with chronic sinusitis or have other persistent nasal or sinus issues, make an appointment with an ENT to check for nasal polyps. Your doctor will be able to easily diagnose these polyps in their office. If you have them, addressing them might finally provide you with sinus relief. Following your doctor’s instructions can also help you to prevent more polyps in the future. While this isn’t a guarantee for everyone, your ENT will be able to determine the cause of your polyps and recommend home remedies and triggers to avoid. Working these into your lifestyle (along with your medication) can help you feel better. Do you think you might have nasal polyps? Don’t wait to get your symptoms checked. Contact Dr. Michael Burnett at 212-867-4813 to schedule an ENT appointment today. Most people will deal with an ear infection at some point in their lives. This condition is very common among children but can affect people of all ages. There are many different ear infection symptoms. Regardless of the type of ear infection you have, you will want to deal with the pain and irritation right away. Keep reading to learn about ear infections so you can go to your doctor’s appointment informed. Ear infections (also known as acute otitis media) are caused by a variety of things, but the most common causes are viral or bacterial infections in the middle part of the ear or excess fluid in the middle part of the ear. This part of your ear contains delicate eustachian tubes that are prone to fluid buildup and infection. Young children are most likely to get ear infections because their eustachian tubes are very small and have a difficult time clearing themselves out. Eustachian tubes often get blocked due to excess fluid from another infection. Sinus infections, colds, tonsillitis, and allergies can all cause ear infections. While you’re most likely to get an ear infection from another illness (especially as an adult), other issues can cause infections too. Cigarette smoke and changes in altitude can both lead to ear infections. People can even cause ear infections themselves by inserting objects like cotton swabs in their ears. Ear infection symptoms vary from person to person and might change depending on the cause of the infection. Some common ear infection symptoms are ear pain that can range from mild to severe, pressure or irritation inside the ear, changes in hearing, and fluid draining out of the ears. Babies and young children also tend to get fevers during ear infections. Ear infection symptoms can occur in one or both of your ears. Symptoms might also change over time. Some people (usually children) with ear infections also experience a loss of balance, headaches, and/or changes in appetite. Because this issue is so common for kids, it’s important to consider an ear infection every time your child is under the weather. If you suspect you or your child have an ear infection, it’s important to see a doctor right away. While your symptoms might just seem annoying, they could be caused by an infection that requires prescription medication to treat. This is especially important if you or your child have a fever, hearing loss, or symptoms that do not get better after 7 days with over-the-counter medication. While most ear infections can be treated with medication and home remedies like a warm cloth placed on the ear, chronic ear infections may require surgery to fix. Your doctor will be able to evaluate your symptoms and create a treatment plan that gives you long-term relief. If you are dealing with an ear infection, help is available now. Sore throats are a symptom of many different conditions. If you have throat pain that lasts, you might have an infection. While throat infections are painful, most can be fixed with a medication or a simple medical procedure. In this article, we will discuss different common throat infections and how your doctor can help you deal with them. A virus is a common cause of throat infections. A variety of viruses can cause these infections, but colds and the flu are the most common sources. While colds are different from the flu, both usually begin with similar symptoms. As a cold progresses, you will notice symptoms like a cough, runny nose, and possibly swollen glands. The flu typically lasts longer than a cold and usually involves a fever and muscle aches. Another common virus that can cause a throat infection is mononucleosis. Also known as mono or the “kissing disease”, this condition is usually caused by the Epstein-Barr virus and is spread through saliva. Mono is often misdiagnosed as strep throat because sufferers usually have a very sore throat. Other symptoms include fever, swollen lymph nodes, and extreme fatigue. Viral throat infections can often be treated with over-the-counter medications. Antibiotics will not treat these conditions. It’s important for your doctor to determine if you have a viral or bacterial infection so you can take the correct medicine. Bacterial throat infections are especially important to see your doctor about. Not only do these infections require antibiotics to heal, symptoms usually get progressively worse until you begin antibiotics. There are a variety of bacterial throat infections, but the most common is strep throat. Strep throat is caused by a strain of streptococcus bacteria. This infection is most commonly found in children and teens, but it can affect patients of all ages. Strep throat patients usually have a very sore throat with white patches appearing in the back of their mouths. Other symptoms can include swollen lymph nodes, fever, headaches, and chills. Your doctor can perform a simple test in their office to check for strep throat or other bacterial throat infections. Tonsillitis, or inflammation of the tonsils, is another condition that often leads to throat pain. This can be caused by either a viral or a bacterial infection. Tonsillitis can affect anyone, but children are most likely to have this problem. Tonsillitis typically causes a sore throat that is accompanied by red, inflamed tonsils and swollen glands. Tonsils may also have white or yellow patches. Other common symptoms of tonsillitis include fever, headache, and trouble swallowing. While infected tonsils are often removed, this surgery is only performed if other treatment methods are unsuccessful. If you think you have tonsillitis, see a professional. Your doctor will be able to treat the problem and prevent the tonsil issues from returning. If you suspect you have a throat infection, help is available. Whether you get the occasional nosebleed during the winter months or you deal with chronic bleeding regularly, suffering from a bloody nose is uncomfortable and inconvenient. Many different issues can cause nosebleeds. Because nosebleeds aren’t usually painful, it can be difficult to tell when the issue is bad enough to consult a doctor. Read on to learn more about this condition and when you should seek help. There are two different types of nosebleeds and each has its own causes. Anterior nosebleeds are most common and occur in the front of the nose. They occur when the thin blood vessels in your nose become irritated due to dry air, exposure to smoke, allergies, or minor traumas like nose picking. Anterior nosebleeds don’t usually require medical attention as the bleeding usually stops on its own. If you experience this type of nosebleed, sit up straight, remain calm, and use a tissue to absorb the blood. You may also find that gently blowing your nose or pinching the bridge of your nose helps the bleeding to stop sooner. Posterior nosebleeds are less common and but more serious. These nosebleeds occur high in the nose or septum and the patient will experience blood flowing down the back of their throat as well as out their nose. A variety of things can cause posterior nosebleeds, ranging from simple issues like allergies to complex problems like tumors or bleeding disorders. Home treatment for posterior nosebleeds is similar to anterior nosebleeds. However, if you are experiencing this type of bleed it’s important to make a doctor’s appointment right away. There are numerous home remedies you can try to prevent nosebleeds before they start. If you suspect your nosebleeds are the result of allergies or dryness, try a saline nasal spray. These sprays can be purchased over-the-counter or prescribed by a doctor. You can also make a simple saline rinse at home with table salt and lukewarm water. Using a humidifier is another simple and effective way to keep the nasal passages from drying out. If you suffer from nosebleeds, take small steps in your daily life to avoid triggering them. Keep your mouth open while sneezing to avoid excess nasal pressure, and avoid putting objects like fingers or q-tips in your nose. Also, be aware that secondhand smoke can trigger nosebleeds, so limit your exposure to smoke. Most nosebleeds are painless and caused by an easily treatable problem. Don’t panic if you suffer from the occasional nosebleed, especially if you can easily identify its cause and do not feel dizzy due to loss of blood. However, there are times when nosebleeds require prompt medical attention. If you have experienced trauma, feel weak or dizzy due to blood loss, or have a nosebleed that does not stop, see a professional. Your doctor can create a treatment plan for your specific situation. If you suffer from nosebleeds, help is available. If you deal with chronic throat infections, you are probably desperate for relief. While medication can help treat infections, people who deal with these infections on a regular basis might need a tonsillectomy to fix their issues. Fortunately, tonsillectomies (or tonsil removal surgeries) are very common and easy for your doctor to perform. In this article, we will discuss the tonsillectomy procedure and recovery process so you can book your surgery with confidence. There are a few different situations that will cause a doctor to order a tonsillectomy. The most common reason for a tonsillectomy is chronic tonsillitis, or recurring sore throats caused by tonsil inflammation. Tonsillitis is most common in pre-pubescent children but can affect people of all ages. Tonsillectomies are also recommended for patients who have bacterial tonsil infections that do not improve with antibiotics. Occasionally, other issues will require tonsillectomies as well. These include breathing problems or sleep apnea related to swollen tonsils, frequent snoring, tonsil bleeding, or even cancer affecting the tonsils. These problems are less common that tonsillitis, but can be very serious. Your doctor will likely try other treatments before ordering a tonsillectomy. You will need to fast the night before your tonsillectomy. This will mean avoiding all food and liquids, including water. Some patients may feel nervous fasting, so it can help to schedule your tonsillectomy early the next morning. Before you go in for your procedure, make sure you have a comfortable place set up in your home for recovery. You’ll also need to find someone to take you home from your appointment as you will not be able to drive. During the procedure, there are a few different methods your doctor can use to remove your tonsils. Some doctors will use a scalpel to cut your tonsils out, known as a cold knife dissection. Other doctors will use a special device to cauterize (or burn) your tonsils. Both are very safe. Because you’ll be under general anesthetic, you won’t feel any pain while your tonsils are removed. After your surgery, you will most likely deal with a sore throat as you recover. While eating and drinking might be painful, it’s important to stay hydrated. Water and ice pops will help with this. You might also want to stick to a diet of soft, bland foods like mashed potatoes or applesauce while your throat heals. During recovery, it’s also important to rest. Stay in bed for the first few days of your recovery, and avoid strenuous activities and exercise for two weeks while you fully heal. It’s also important to take any medications that your doctor prescribes, as these will help prevent future infections and reduce your pain. Like any surgery, a tonsillectomy can seem intimidating. Talk to your doctor about any fears you might have, and they will put your mind at ease. After you recover, you’ll be glad you had the surgery. If you think you need a tonsillectomy, don’t put it off. 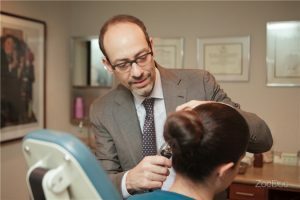 Contact Dr. Michael Burnett at 212-867-4813 to schedule an ENT appointment today. It can be scary to suddenly feel dizzy when the room around you is still. Sudden dizziness, or vertigo, is uncomfortable and disorienting. However, many adults deal with it. In this article, we will explain the difference between dizziness and vertigo and why you may be experiencing this feeling. With the right information, you’ll be able to explain your symptoms to your doctor and explore possible solutions. One of the problems with feeling dizzy is that it can be caused by so many different health issues. The most common cause of dizziness is an inner ear problem, which we will discuss below. Heart conditions, migraine headaches, and even diet problems can all cause vertigo too. It’s important to discuss all of your health conditions with your doctor if you are experiencing vertigo, even if you don’t think the condition is relevant. You would be surprised how many conditions leave you feeling dizzy! Dizziness can also be a side effect of certain medications, such as blood pressure medication. Call your pharmacist if you want to check on your medicine’s side effects or possible drug interactions. Don’t forget to assess your mental health as well. Dizziness is a common symptom of anxiety, and many people suffer from vertigo while having a panic attack. On rare occasions, dizziness can be caused by a life-threatening condition like a stroke or a brain tumor. If your symptoms are severe, seek medical attention right away. As we mentioned, vertigo is frequently caused by an inner ear problem because the inner ear is one of the parts of our body that controls our sense of orientation and balance. Benign Paroxysmal Positional Vertigo (or BPPV) is one of the most common causes of vertigo. It occurs when small calcium particles collect in the inner ear and affect a person’s balance. This type of vertigo is often associated with old age. Meniere’s Disease is another cause of vertigo. This disorder is caused by frequently changing pressure and fluid buildup in the inner ear. In addition to vertigo, patients with Meniere’s Disease usually report tinnitus (or ringing in the ears) as well as hearing loss. There are also a variety of ear infections, such as vestibular neuritis, that can cause vertigo as well. Depending on the condition, medication might be needed. If you are experiencing vertigo, it’s important to see a doctor. Because dizziness can be caused by so many things, a professional will be able to look at your complete health history and lifestyle and determine the exact cause of your problem. Your doctor will also be able to create a treatment plan that works for your specific issue. If you are experiencing sudden, severe vertigo or other symptoms of a stroke, call 911. Working with a doctor will help you get to the bottom of your dizziness problems. Contact Dr. Michael Burnett at 212-867-4813 to schedule an ENT appointment today. What Causes Recurring Nose Bleeds? Sore Throat: When Are They Serious? Age Related Hearing Loss: Can It Be Treated? What Kind of Tests Does an ENT Doctor Do? How Serious Are Ear Infections? Could You Have a Balance Disorder? Top Specialist in Problems of the Ear, Nose, Sinuses and Throat.